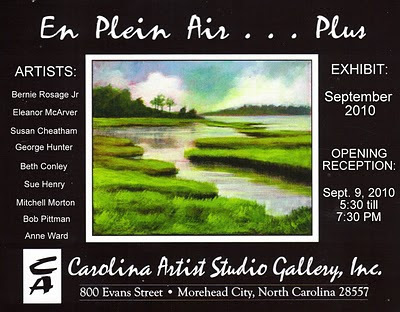 September 9, 2010 ~ Opening reception for "Plein Air Plus" Show at Carolina Artists Studio and Gallery in Morehead City (details on earlier post on this blog) ~ You are invited to show support for Mitchell, Bernie, and Susan for this special show. September 28, 2010 ~ OOPS members must have their paintings (up to 5 paintings)turned in by 4PM to the Council for the Arts for October "OOPS II Exhibit". The paintings must be framed and wire hung. October 3-29, 2010 ~ OOPS Gallery Exhibit ~ OPPS II Exhibit ~ Baysden Gallery, Council for the Arts, Jacksonville, NC. Jacksonville based group: Onslow Outdoor Painters Society (OOPS) will showcase their latest paintings of our surrounding region..
November ?, 2010 ~ OOPS Monthly Paint Out ~ Sunday from 1PM until ~ Humphrey Pond and Homeplace ~ Great opportunity for some fall color. Organized by Bernie Rosage. December 2010 ~ OOPS Monthly Paint Out ~ Date and Location TBA ~ Need a Volunteer to organize this! May ? ?, 2011 ~ OOPS Paint Out ~ Annual Banks Party ~ Sunday, 10am -4pm ~ Pellitier House, Downtown Waterfront, Jacksonville, NC. June ? ?, 2011 ~ Date and Location TBA ~ Somewhere in Wilmington... Organized by Ann Lees. Thanks to those hwo have contacted me to let me know they can help. I have added some names already into the line up of paint outs of those wanting to help. Please take note and begin thinking of a date and location. I need more volunteers.... especially for October and December of this year. September 11 and 12, 2010 ~ 8th Annual IPAP Worldwide Paint Out ~Doentown New Bern ~ participate when you can. October ? ?, 2010 ~ OOPS Monthly Paint Out ~ Date and Location TBA ~ Need a Volunteer to organize this! September's Paint Out for OOPS will be our annual involvement with the Washington, New Bern, Carteret, and Oriental Plein Air groups. As usual we will all converge on the centrally located town of New Bern ( anywhere in the downtown historic district). The event will take place Saturday, September 11th and Sunday, September 12th, 2010. There is NO set schedule... simply agree to paint on one or both days to help promote the tradition of plein air painting worldwide. Mitchell, Bernie, and Stephen will be painting at Cone Manor in Blowing Rock, NC to do their part. They are taking a plein air workshop in the NC mountains. "En Plein Air... Plus"... plein air art exhibit. September 2010; Opening Reception Thursday, September 9, 2010 from 5:30 - 7:30 PM. Carolina Artist Studio Gallery, Inc. 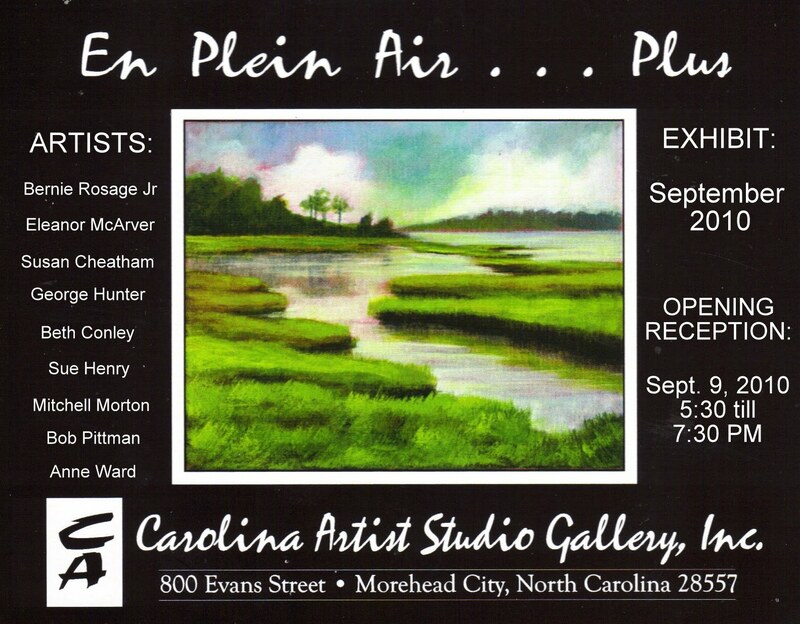 Please make plans to attend the Opening Reception for Carolina Artist Studio Gallery's exhibit "En Plein Air... Plus". The exhibit will feature plein air paintings by local artists; Bernie Rosage Jr., Eleanor McArver, Susan Cheatham, George Hunter, Sue Henry, Beth Conley, Mitchell Morton, Anne Ward, and Bob Pittman. The paintings will be displayed in the gallery throughout the entire month of September, 2010. Telephone (252) 726-7550. What is your painting "song?" What makes a painting "sing?" We will delve more deeply into what makes a painting sing and how to make YOUR paintings sing your song! This is a special 2 day plein air workshop will to assist you individually with what you are doing well and what you can do to advance your imagery: whether it be color, compositional or other issue. We'll also discuss barriers to advancement and how to break them - ...whether mental or technical. Download the comprehensive PDF package to learn more and join me for this unique two days! WHEN: Saturday Night, August 21, 2010 from 6PM until... Organized by Mitchell Morton. WHERE: Bicentennial Park, Swansboro... meet at the Otway Burns Statue. WHY: Painting at night to try something new and BREAK the August HEAT! Simply put... we LOVE plein air painting!